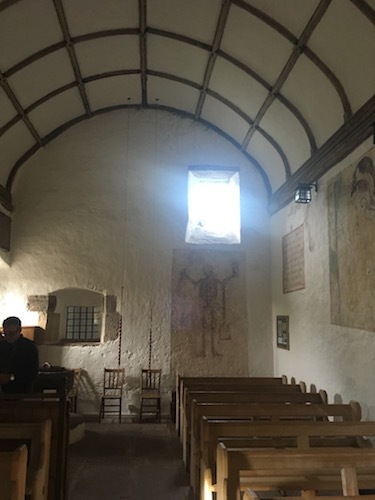 At the Eastern fringes of the Brecon Beacons National Park, on the edge of the Black Mountains, where wild untrammelled landscapes becomes fields and winding lanes, the tiny hillside church of Patrishow or Patricio looks out over panoramic views. 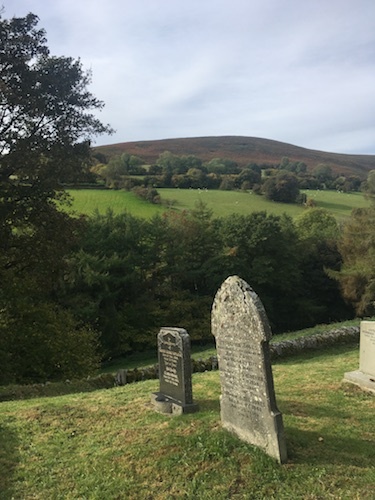 About five miles from Crickhowell on the southern slopes of the Gader Range, this is an isolated place and not easy to find as you wind upwards along hedgerow thickened lanes. 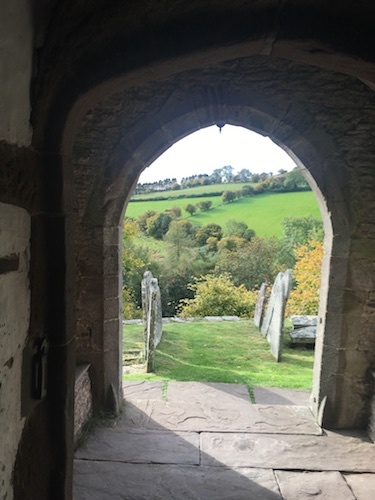 Before you reach the church you will pass a spring where Issui, a sixth century Celtic saint, murdered by a traveller who had refused conversion, had his cell. 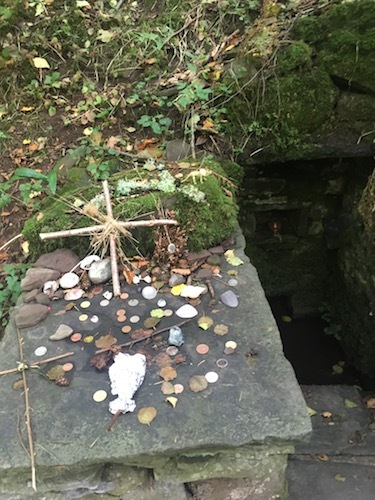 The site became a place of pilgrimage and there is still a pagan feel as coloured ribbons hang from trees and offerings and coins have been left on the stone steps that lead down to the spring. Further up the hill, the stone church named for St Issui was built in the eleventh century and then extended in the fourteenth century. It was further restored in the early nineteen hundreds. The church is a simple Gothic with a stone gable and bellcote but it contains treasures. 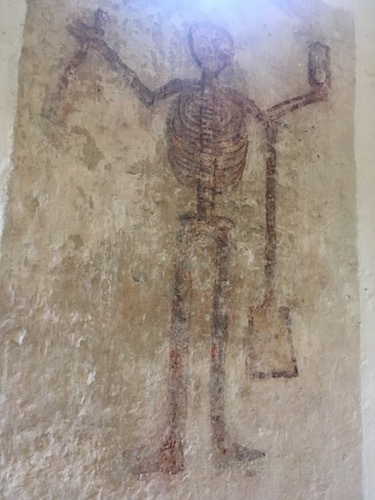 Within are four groups of wall paintings, of which the skeleton, known as the Figure of Doom, is the most spectacular. He is holding a scythe and an hourglass and has a spade hanging over his arm. He would have been a visual reminder to an illiterate congregation that they must use their limited time on earth wisely. Legend has it this figure has been whitewashed over many times but keeps reappearing. 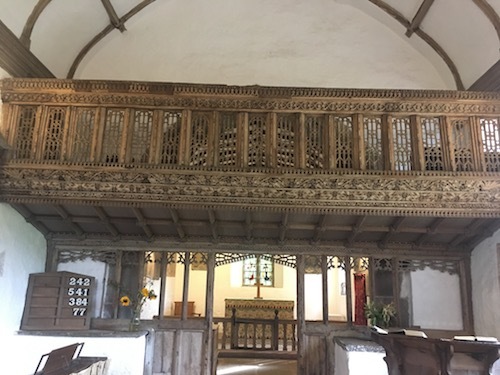 Stretching across the interior, below the whitewashed vaulted ceiling, is one of the finest pieces of medieval art in Wales: an intricately carved Rood screen, carved in Irish bog oak, from the late fifteenth century. 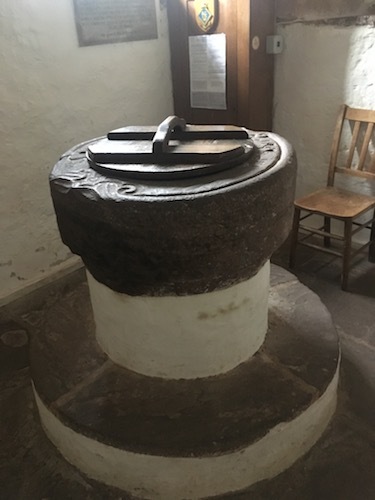 The font is one of the oldest in Wales and dates from the tenth century whilst within the churchyard stands a rare medieval churchyard cross . When we arrived on a Sunday morning in September, we found no one about. As we were leaving, we met a charming be-suited older man carrying a battered electrical heater under his arm. He told us he was preparing for the upcoming morning service, ‘and’ he added, ‘you can certainly let your dog out of the car, he’s welcome here”. 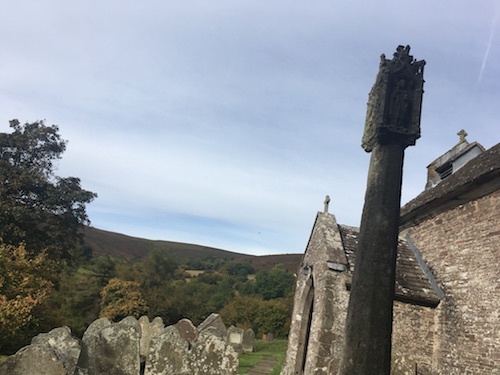 When we commented on how we found church so beguiling and its setting, with the views stretching away below, incredibly beautiful, he told us many who visit the church will mention its particular atmosphere of quiet serenity. 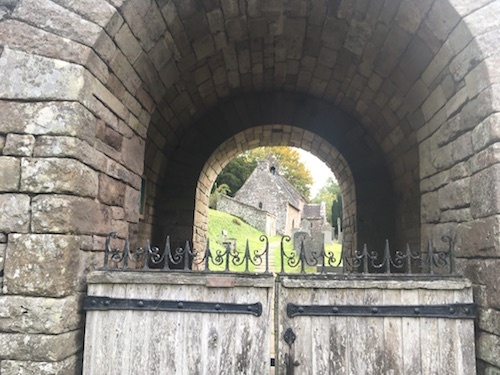 The churchyard is crossed by a footpath that leads walkers right to St Issui’s main entrance. 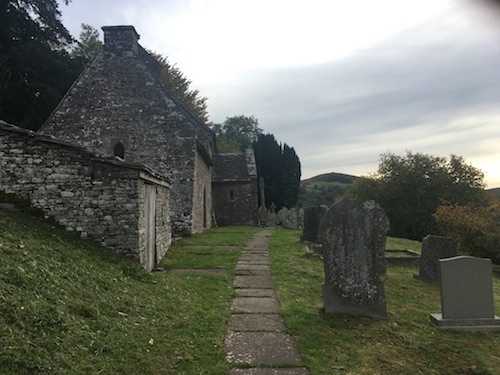 Whether you are modern day pilgrim or a traveller to this part of Wales, take a detour to seek out Patrishow’s gem of a parish church. And, it is good to know that even in its remoteness, it continues to be a living place of worship. One of the most serene places that I have ever been.